Our research is investigating the evolutionary factors shaping not only the pain-inducing defensive toxins in cobra venom, but also the parallel evolution ornate markings on their hoods, and the extremely bright warning colourings present in some species. We have found that the pain-inducing defensive toxins first evolved alongside the broad hoods that make cobras so distinctive. Further increases in the potency of the toxins subsequently occurred parallel to their warning strategies such as hood markings, body banding, red colouring and spitting. Their spectacular hoods and eye-catching patterns evolved to warn off potential predators because unlike other snakes, which use their venom purely for predation, cobras also use it in defence. Typically it has been thought that only spitting cobras had these defensive toxins in high amounts in their venoms, however we’ve shown that this toxin type evolved with the ability to hood in the common ancestor of Hemachatus and Naja. Further increases were linked to the evolution of ornate patterns as well as the three separate evolutions of spitting (Hemachatus, once in African Naja and again in Asian Naja). The pain inducting toxin type in Hemachatus and Naja are modified three finger toxins that have switched from the ancestral toxic effect of antagonistic binding of post-synaptic nicotinic acetylcholine receptors to the pain-inducing cytotoxicity. This toxin class is small enough to be absorbable in the eyes and cause immediate pain there. Thus there was a selection pressure for the evolution of spitting. King cobras (Ophiophagus genus) are genetically distinct from other 'cobras' and convergently evolved their hooding ability. Parallel to this they convergently evolved pain-inducing defensive toxins. While the function is the same (pain) the convergence reflected by differences in the underlying mechanics, with king cobras using L-amino acid oxidase enzymes to accomplish the same outcome. These toxins are far too large to be readily evolved in the eyes, and there there was not a convergent selection pressure for the evolution of spitting. However, like in Hemachatus and Naja, there is a pattern in that the most conspicuously marked populations have the highest levels of these defensive toxins. 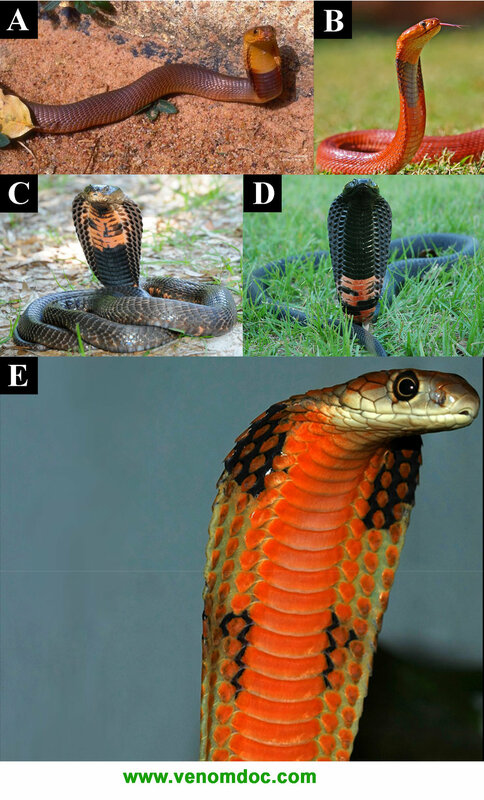 In the case of the kind cobras, it is the Malaysian population with its bright orange hood markings that that contains the highest amounts of the pain inducing toxins. Secondary losses are as evolutionarily interesting as secondary increases. Within Naja, the water cobra has secondarily dramatically reduced the hood as the elongate ribs would impair swim performance, and thus there was a selection pressure for their reduction. 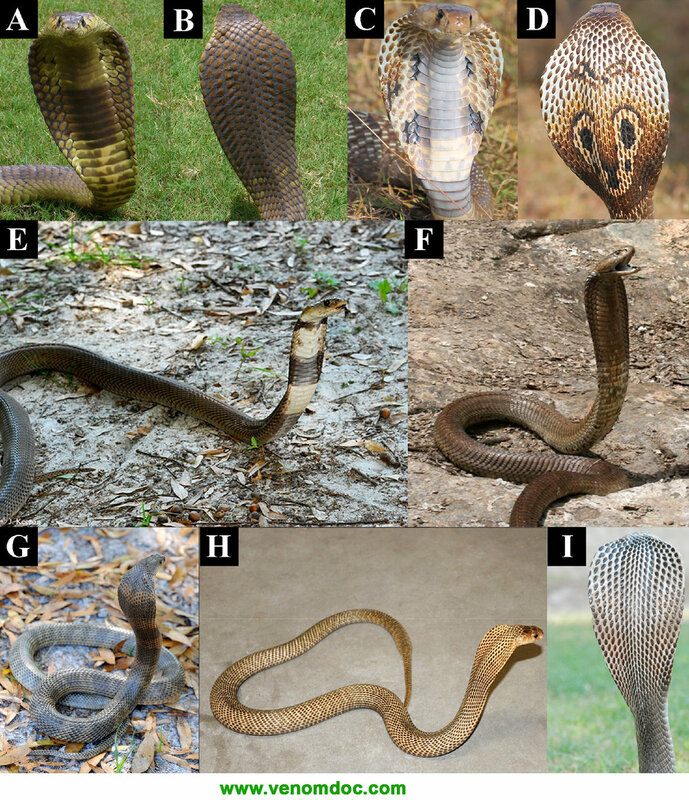 As these species do not do the hood displays like other cobras, there has also been a secondary loss of the defensive toxins. In other cobras, some species have secondarily lost the conspicuous hood markings (such as Naja oxiana and Naja philippinensis) and the venoms are similarly much reduced in the relative content of the defensive toxins.